The most recent of my latest group of paintings, it was also the largest. 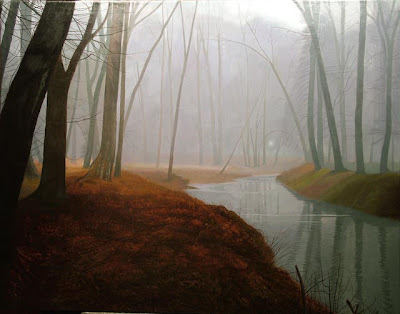 It depicts a forest scene in Powhatan County along the banks of Fine Creek in a place known as the Foundry. The property contains a large stone building with 3 foot thick stone walls that was originally built in 1816 to manufacture arms and munitions for the Federal Government. After years of disuse, it was acquired by the artist Julian Binford and his wife who undertook a massive reconstruction of the old stone buildings which they eventually occupied. In the 1980s the property was acquired by a group of investors who set out to create the only true golf-only facility in the area. It is now one of the most exclusive golf courses in the Richmond area and I have been apprehended and escorted out of the property during my numerous attempts to visit it and photograph its breathtaking views. The one seen here is near the front of the property adjacent to Huguenot Trail or Virginia highway 711. There is a single light source emanating from one of the many stone outbuildings associated with the course. Fine Creek meanders through the center of the painting and the trees seem to lean in towards one another as if they are gathering to discuss their plans for the day. I hope someday to play this exclusive course- I just have to meet the right person who can give me access to its many hidden secrets. One of the notable historic facts about the area is that part of the property was owned at one time by Robert E. Lee's brother who invited the general to bivouac there on his way home to Richmond from Appomattox where he had surrendered to the Northern Armies. An historic marker records the event. Today I'm taking a look at the second of my recent paintings. "Winter Morning" is an unusual image. 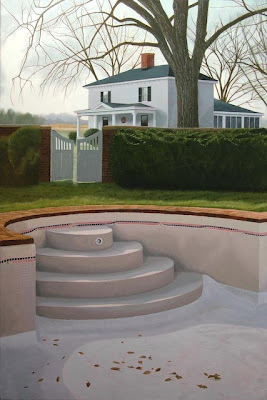 It depicts an empty in-ground pool that has some years on it. It is the centerpiece of a beautiful Gillette garden that is part of a farm currently owned and run by one of my patrons and his family. While I was there I took a ton of pics and made notes which I turned to for this painting. There is a tall serpentine brick wall that runs around the garden which is filled with some of the finest, healthiest boxwoods I've ever seen. Just beyond the wall is the smaller house that is depicted in this painting. It is now a rented duplex, but was probably at one time home to the hired help that was there to assist in running the farm. 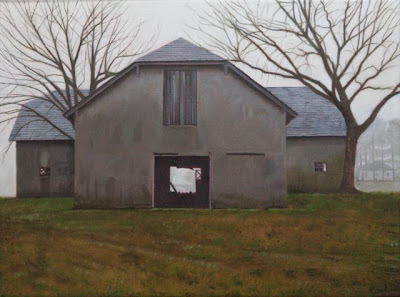 The whole image has a mysterious, Hitchcock kind of feel to it with the barren tree in the middle ground reaching across the house towards the horizon in the distance. Because the pool is empty, it becomes more sculpture than pool and I am fascinated by the oval steps that take on the appearance of a wedding cake. The cast shadow that surrounds the area of light in the foreground is the result of the winter morning light hitting the edge of the pool. The leaves that are left there create their own little shadows and give dimension to the pool floor beneath them. I added the garden gate from another part of the estate and drew it with the gate ajar in order to allow the eyes and the imaginations of the viewer to pass through the imposing dark shape of the brick and boxwood wall to the yard that lies beyond. 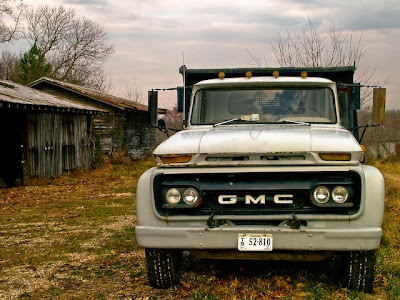 One of the most interesting things about this farm is that it lies adjacent to Shirley Plantation, one of the best known of the many historic estates along the Route 5 corridor. I spent some time at the plantation after I finished up at the Nordt farm and will share a photo of Shirley in a subsequent post. So, I've decided to start a blog to track the progress of my paintings and share the process with others. I look forward to being able to look back at the blog as a kind of personal journal that may become a way of gaining insight into my own work process. 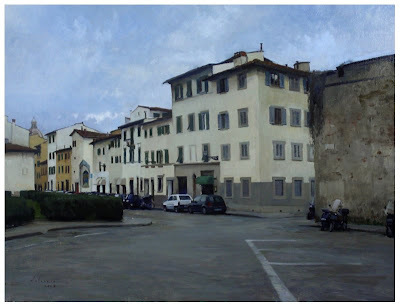 I've just completed three major paintings and delivered them to The Glave Kocen Gallery. The paintings are now hanging and are being shown tonight at a fundraiser for the Richmond Symphony. These paintings are the result of my work over the past several months and are being added to my website this week. The painting shown here is entitled "Distant Echoes" and is an image taken from Richmond's Maymont Park, a Victorian manor house and park that was built by industrialist James Dooley in the late 19th Century. It shows a decaying marble and iron gazebo that overlooks the lower portion of the park which contains the oriental gardens. 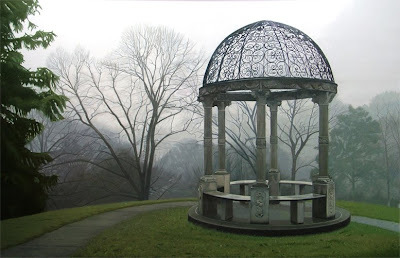 The gazebo is an echo of a past era when lovers met there to talk and express their affections. The landscape suggests a distant river bank where the words and thoughts could echo back to the viewer. The ornate ironwork of the top of the gazebo is particularly intriguing and has held up well over the years. One of my favorite recent paintings.